I was fretting about my blog yesterday, because I haven’t been writing much. And I decided there and then, one of those “defining decisions” in Mark Batterson’s phase, that shape a life, that I would never fret about my blog again. That I would instead entrust it to God and work with the power of the Holy Spirit. Also—and I exhaled a big sigh of relief at this decision—that I would never allow myself to fret, or be jealous, or made anxious by anyone else’s success. Ah, let me tell you, this resolution is a BIG help when you wade through your Facebook newsfeed of bloggers and writers reading, writing, publishing, connecting, shining, and you, you are tired, and trying to learn to run, and get organised, and wake early and work long hours–keystone habits you really should have got down in your twenties, keystone habits you try to impress on your girls. However, if a spiritual writer wants to bear fruit that will last, as I want to, what she really needs to be able to do is tune in to God’s voice, to hear what the Spirit is saying to the church and to her. And in this lonely, solitary pursuit, there is no competition. How foolish for Isaiah to try to be small and jewelly like Habakkuk, or Habakkuk to want to be as sweeping and devastating as Jeremiah. Or for Micah, the down to earth, to want to be wildly, mysteriously prophetic as Ezekiel was–mystic creatures, and wheels within wheels! And Joel, with his promised comforts of restoration and the Holy Spirit, is writing just what he is supposed to write, though he might not diet like Daniel, nor brave the jaws of lions. Each of them, while being sheerly themselves, inspire us, in different ways. This then is the task before writers—what we once did instinctively as children. What we once could not help doing. To be ourselves. has spoken to people’s hearts just as much as Jeremiah who wrote 52 chapters, but also comforts us in a beautiful image of Christian productivity—sending out your roots to secret streams. Joel who, in three chapters, assures us that the Lord can restore the years the locusts have eaten because, heck, he created everything and so he can– and promises us more, that the Lord will pour out his spirit on all flesh, both men and women speaks as powerfully to us as Ezekiel who writes 48 chapters, and offers a vision of enduring creativity for those who live in the river of God’s blessing. 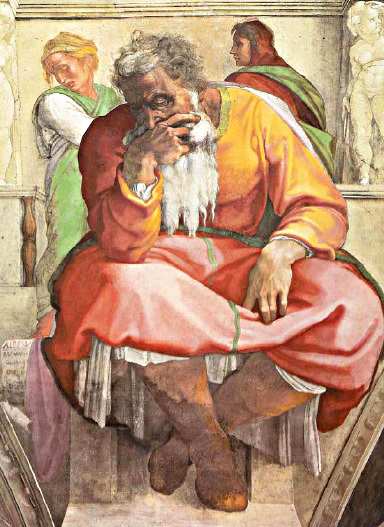 Through the process of living, we discover whether we are called to be beautiful miniaturists like Habakkuk, Joel or Micah, or mighty thundering prophetic voices like Isaiah, Jeremiah and Ezekiel–or whether, indeed, our legacy might purely be what we did, not what we said, like the prophets Elijah and Elisha. To be happy and holy, and God’s writer, however, we must be the writer we are, within the limits of our strength, energy, education, intelligence and personality, and rejoice and be glad in the calling he has chosen for us from all eternity, because he loves us! Oh to be oneself in God. Such a simple and challenging thing. This is exactly what the Holy Spirit has been whispering to me in my times with Him. Blessings to you as you continue to write. Anita, what a great perspective, and one I needed to peer through today! I’m definitely a Jeremiah-type… with an awe, and perhaps envy, of Isaiah-types. I do love visiting your blog – thank you! Absolutely. There is a lot of freedom and peace in that reorientation! I think that the Lord is speaking to us in the same way! Hi Jim–yes, speaking to us on the narrow paths to peace! So well said! When we stop wishing for gifts we don’t have, we can finally appreciate the ones we do. Acceptance of one’s self is perhaps one of the most liberating stages to reach in life.